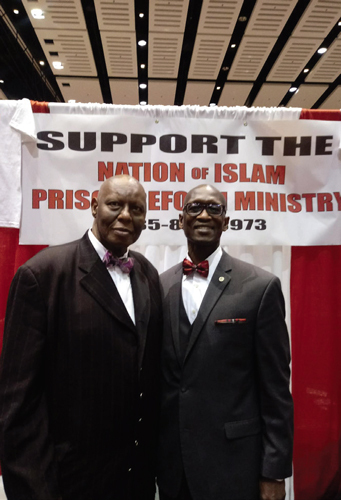 National Student Prison Reform Minister Abdullah Muhammad with Brother Kenneth 5X. As I sat in my seat in the United Center, listening to the Honorable Minister Louis Farrakhan give his monumental Saviours’ Day address, “A Saviour is Born for the Whole of Humanity: No One Need Perish,” I began to reflect on my life and how truly blessed we are to have someone like the Honorable Minister Louis Farrakhan to care about us. As I thought of the adversity and some of the difficulty factors I had to overcome just to be in that seat, tears fell from my eyes because I knew only Allah (God) could have made this day possible. For it was just seven months ago that I was languishing in a prison cell not knowing if I would ever get out, and now I was listening to the messianic voice of God, the Honorable Minister Louis Farrakhan. I asked myself the question found in the book “Message to the Blackman,” posed by the Most Honorable Elijah Muhammad where he states “how can I repay Allah for His Coming?” The one thing that flashed across my mind was to use my life to bear witness to the world as to WHAT ISLAM HAS DONE FOR ME. 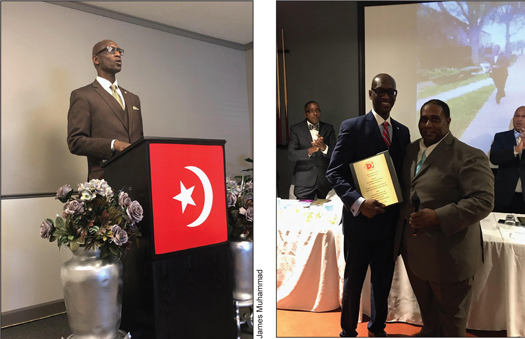 (l) Brother Kenneth 5X speaking (4) Brother Kenneth 5X receiving the True Prison Reform Service Award from Student Prison Reform Minister Eric Brother Kenneth 5X Muhammad of Muhammad Mosque No. 60. For the next seven years I tried to find a way to cope with the myriad of emotions that I felt; grief, depression, frustration, and of course anger. I tried everything I could to get some relief from the veritable hell I was in, all kinds of coping mechanisms, but eventually they all failed. Then one day a neatly dressed, highly disciplined brother invited me to attend the Nation of Islam services held in the prison chapel. As I sat in that seat watching an old VHS tape of the Honorable Minister Louis Farrakhan, I heard him say “there is no human being that cannot be redeemed,” and those words struck a chord with me. It was as though he was speaking directly to me. I began to attend the NOI services regularly along with studying the Teachings of the Most Honorable Elijah Muhammad. One of my favorite courses of study was (and still is) the Self-Improvement Study Guides. I began the arduous task of Self-Examination, Self-Analysis, and ultimately Self-Correction. The more I submitted to the Divine Teachings of the Most Honorable Elijah Muhammad under the guidance of the Honorable Minister Louis Farrakhan, the greater the desire burned in me to atone for the wrong I had done. I began to propagate the Teachings every chance I got. I was blessed, by Allah’s permission to re-establish eight NOI Study Groups, two NOI libraries which contained all the books, Study Fuides, and over 300 DVDs. We organized a conflict resolution committee, a gang-transition protocol, GED study halls, and a 3-pt. program taken from the Millions More Movement using Unity, Education, and Cultural Awareness as the focal points. No matter what obstacles were put in my way or adversity, I had to endure, I was determined to do all I could to spread the message of Atonement, Reconciliation, and Responsibility across the entire Department of Corrections. I began teaching at Lake County Regional Correctional Facility, then I was transferred to South Central Correctional Facility where we were blessed to establish a Study Group at all three sites. After four and a half years of work, I was transferred to West Tennessee State Penitentiary and with Allah’s help established three study groups and organized the Nation’s Program which culminated in our hosting the Student National Prison Reform Minister Abdullah Muhammad. I was eventually transferred two more times, first to Whiteville Correctional Facility, then to Northwest Correctional Complex, each time organizing NOI Study Groups with the assistance and guidance of Muhammad Mosque No. 60 Prison Reform Ministry. I kept working every day and the words of the Honorable Minister Farrakhan proved true: Development Outgrows Confinement, and on July 17, 2018 after being handed a life sentence, I walked out of prison. Brother Kenneth 5X is a Student in the NOI Prison Reform Ministry at Muhammad Mosque No. 55.